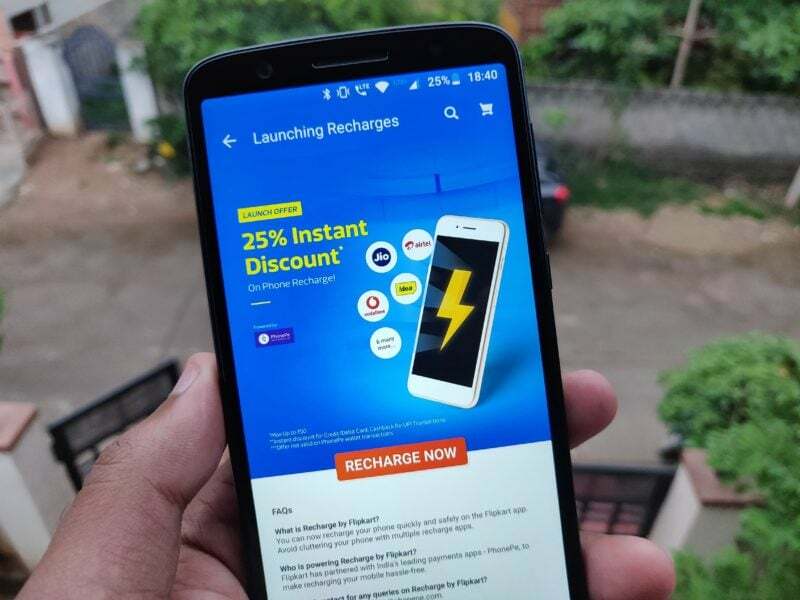 Flipkart has rolled out a new update to its mobile application which has added a new feature called ‘Recharges.’ PhonePe, the Flipkart-owned company powers the recharges option on Flipkart. At the moment, the company is offering only prepaid recharges on the portal and states that postpaid bill payments will be launched very soon. As part of the launch offer, Flipkart is offering an instant 25% discount on first ever prepaid mobile recharges done using credit/debit card on Flipkart through PhonePe. Furthermore, there’s another 25% cashback offer on the first ever prepaid mobile recharges done using UPI on Flipkart app through PhonePe. Both the instant discount and cashback offers will be valid until July 31. Flipkart’s primary rival, Amazon India is also offering mobile recharges on its portal for a long time. And this move from Flipkart will counter Amazon, and there’s no denying that PhonePe has a bigger reach than Amazon. Notably, Amazon is offering mobile recharges on its mobile application and website as well. Coming back to the cashback and instant discount offer on Flipkart app, a user can avail the offer only once until July 31. And the max discount/cashback is Rs 50 for every user. Alongside prepaid mobile recharges, Flipkart has also rolled out ‘Travel by Flipkart‘ feature on the app, which is powered by MakeMyTrip. Under Travel by Flipkart option, the e-commerce portal is allowing users to flight tickets through MakeMyTrip. With these two services, Flipkart is removing the hassle for users of downloading separate apps- PhonePe and MakeMyTrip. For flight bookings, Flipkart is also giving flat 8% instant discount up to Rs 1,500 per booking on domestic flights. A user can avail the discount offer five times during the offer period between July 16, 2018, to July 19, 2018. And the best part of this flight bookings offer is there’s no minimum transaction value to avail the discount.